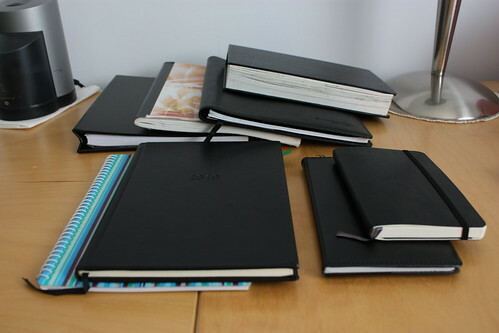 Where have all the notebooks gone? | The Tales of Missus P.
Where have all the notebooks gone? You remember notebooks, right? Not the kind that you plug in and type on while hoping the battery lasts before find a working outlet – I mean the paper kind. I’ve had notebooks for years but now they’re lying around blank. Do we even need them anymore? I see tons of notebooks, journals and all around cute things with endless possibilities of writing in that sea of blank paper. I use to buy them by the dozen because they inspired such great things to jot down. But within the recent years I’ve used them less and less because I was using the computer more. Granted, sending a hand-written letter or postcard is nice. It’s easy to jot something down and lie it on someone’s desk or post it to a stack of papers for a reminder. But now I find it less and less convenient to write down anything. Even my shopping list is online even though we make a preliminary list throughout the week to make sure we get what we need, our basic list is saved online for easy shopping. Notebooks also were used as journals that were kept and looked over years later. Now we have blogs. We have notepad on our phone. We have emails that we can send to ourselves when making blog posts (my favorite way to draft these days.) I wonder if movies ten years from now will show a heroine pouring over an old blog to get the events and emotions from a historical character’s past. I know the notebook is still popular and there are plenty of lovely ones at Paperchase or at the grocery store during Back-To-School sales. But if we’re not working at an office or in a classroom, are they becoming less and less essential for daily life? I keep one with me at all times but only every so often to I jot down ideas in them while I’m out. I have plenty of apps to keep me busy with creativity and productivity these days. It’s a lovely thing, a notebook, but as much as I’d like to keep them as a top priority, they’re usually shelved after buying them. I hate dirtying up such perfect, pretty things. This entry was posted in All About Me, Books, Review, Technology, Travel, Writing and tagged apps, blogging, laptop, notebook, office, school, smartphone, work, writing. Bookmark the permalink. 8 Responses to Where have all the notebooks gone? My laptop has pretty much replaced all notebooks for me. It’s just a lifesaver, saving time and money in a way. But I do write in my journal once in a while, ’cause I do miss it sometimes. I miss writing in my journal as well. Nothing like handwriting out your deepest thoughts. I agree. I usually see notebooks for school but very little stationary. A lot of times I resort to a blank greeting card for such situations. I hope the pen and paper don’t die out. I do the exact same thing. I must have 20 barely or never used notebooks on my self. I mean to write in them, but they are so pretty that I end up typing every thing that I need to say instead. Exactly. I hate the idea of messing up those pretty things. I always have grand ideas for each of them when I buy them too. Maybe their time is numbered, but, I must admit, my trusty black notebook still sees daily use. Sure, my iPhone can catch the rough outline of many of my ideas, but all too often I need a little diagram, or even just arrows pointing to other chunks of text for workflow, or columns – oh, beautiful columns – in which I can list parallel, but not directly related, plot points. That’s a good point. I loved writing in margins when I was in college and keeping notes. Maybe I was just smarter then and had more need to flesh out ideas.